Ginger Dingus uncovers the secret of how Holland America’s chefs know the precise number of surf and turf dishes that will be ordered on formal night. Are you a fan of warm chocolate volcano cake? Does surf and turf on the menu alert you to formal night? Do you insist your seafood be of the sustainable kind? Do you expect your morning cappuccino to arrive at the dining room table piping hot and without an extra charge? Are sweets on your pillow – even a surprise gift of truffles – a given? While cruising through Alaska aboard Holland America’s Westerdam, I indulged in these tasty treats and discovered exciting changes on the cruise line’s culinary horizon. Holland America is kicking its cuisine up a notch, just when other lines are cutting back. Serving sustainable seafood is only thebeginning, and salmon lovers, like me, praise Holland America for its flavor-packed Pacific salmon. Coho is served in the main dining room and Alaskan king in the Pinnacle Grill. During Alaska cruises, “we buy 300 pounds of fresh salmon in Juneau for our on deck barbeque lunch,” Westerdam’s executive chef Vinod Patil told me. Speaking of casual deck lunches, this year HAL introduced gourmet burgers and hot dogs to its poolside dining site. The bill of fare at Dive-In at the Terrace Grill offers cooked-to-order burgers sporting whimsical names. You can snack on a Cannonball, a 1/3-pound beefburger with caramelised onions, bacon and Gouda cheese. Tuck in to a vegetarian Freestyle, a grilled portabella mushroom with cheddar and avocado. The all-beef hot dogs are supplied by Nathan’s Famous, an all-American brand from New York’s Coney Island. The most noticeable change on the culinary scene is the Vista Dining Room’s revamped menu. Not only are there new dishes to be savoured, the menu itself has a new twist. Rather than listing four or five separate courses, there are just two – starters, soups, salads (grouped together) and mains. Desserts, including an excellent cheese plate, appear on a separate menu card. New menu items are largely due to Holland America’s Culinary Council, a team of five renowned chefs led by the line’s master chef, Rudi Sodamin. “Rather than just have one celebrity chef provide a few dishes on our menus (like most cruise lines), we wanted to take the concept to the next level,” said Michael Smith, Senior VP of Hotel Operations. Not only do Council members advise the cruise line on the latest restaurant trends and culinary innovations, they share some great recipes from their own restaurants ashore. San Francisco’s Elizabeth Falkner, the sole female member, for example, contributed her seared scallops with bacon, tomato and avocado puree. On the night her scallops are featured, Falkner’s photo and bio are on the menu. Picture perfect presentations are assured, thanks to color photos of each dish posted in the galley. With so many delectable choices, it’s lucky cruise passengers are a predictable lot. 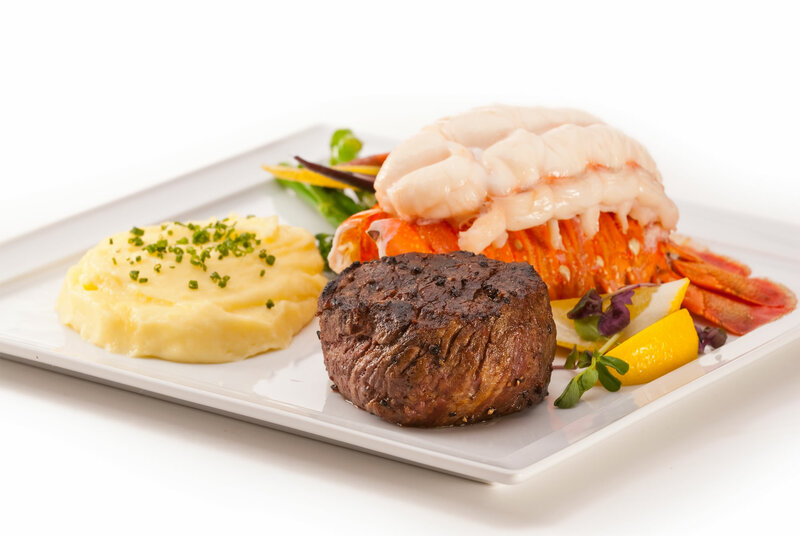 On Westerdam’s formal night, surf and turf (filet mignon and lobster tail) is by far the most popular entrée. Our table fell right in line, except for one order of surf and surf (two lobster tails, hold the steak). “When you compile some three to five years of data, it is very accurate in forecasting how many servings of each dish will be required on any particular night of any particular cruise,” Smith explained. Apparently, Americans from the west coast favour seafood, while southerners consume more beef. Canaletto, the fleet-wide casual Italian dinner trattoria, also has a much altered menu. Tucked in a corner of the Lido, Canaletto’s innovative style is spartire or sharing. Imagine dining around a family table in Italy. The more friends, the merrier. You’re able to order and sample more dishes. At first, I find it all rather confusing. Then the menu gives a clue, suggesting an order of two small plates, one pasta and one large plate, such as sautéed veal piccata, for every two guests. Originally complimentary, Canaletto proved so successful a $10 per person cover is now charged. HAL’s signature restaurant is its Pinnacle Grill, an elegant, intimate space with a sea view. Featuring steak and Pacific Northwest fish, the menu has been refined. Regulars will notice the absence of the once-trendy lobster mac’n’cheese. Dinner ($29 charge per person) begins with appetisers such as lobster bisque with cognac or lump crab cakes with chili-mustard sauce. Main dishes are highlighted by Double R Ranch Northwest beef, with the cuts varying from a 7-oz petite filet mignon to a whopping 23-oz porterhouse. As to seafood, Alaskan king salmon reigns supreme. In the Pinnacle Grill, this superb fish is broiled and topped with a delicate lemon, garlic, herb splash. A cedar-planked Pacific halibut garnished with shrimp scampi is another Northwest delight. Succulent king crab legs were on offer during our Alaska voyage. Our table of eight shared twoplates ($20 each), well worth the additional charge. In traditional steakhouse fashion, sides of grilled vegetables, sautéed mushrooms and classic whipped potatoes may be ordered to share. Vegetarians have not been forgotten and may select a wild mushroom ravioli, roasted pumpkin risotto or stuffed eggplant main. Desserts are no less impressive. The stars are the warm Grand Marnier chocolate volcano cake and the Pinnacle soufflé, a vanilla flavored treat finished with molten Drambuie cream truffle. Care for a snifter of Remy Martin XO? It’s yours for $18.95 a glass. One night each cruise, the Pinnacle Grill is transformed into An Evening at Le Cirque, named for Sirio Maccioni‘s renowned New York dining establishment. While the whimsical circus theme is represented by the china – orangerimmed with cavorting monkeys – the cuisine is serious French continental. The ship’s four-course menu ($49 cover charge) focuses on items available at the landside restaurants, in particular the lobster salad starter, Chateaubriand main and crème brulee dessert. The fish here is a seared Alaskan black cod, and there is a special wine list with labels recommended by Le Cirque. Le Cirque diners enjoy one final surprise. When they return to their cabin, they find a small gold foil box on the bed. Two tiny drawers slide open, revealing heavenly chocolate truffles. While you could easily consider An Evening at Le Cirque as entertainment, it’s in the Culinary Arts Centre where cuisine shows off its fun and fanciful side. Holland America’s compact theater comes equipped with a state-of-the-art demonstration kitchen. 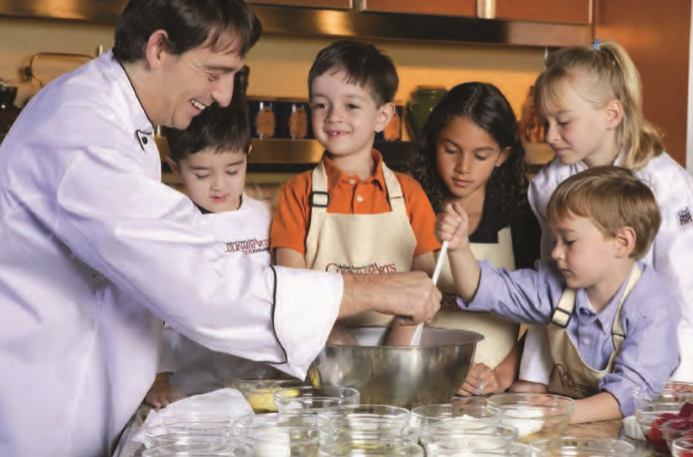 You’ll learn to prepare regional recipes from chefs who spice up their classes with plenty of laughter. On Westerdam, Chef Mauricio Lorca showed us how to prepare halibut Caddy Ganty, a southeast Alaska favorite, and whiskey bread pudding. During hands-on cooking classes ($29 each) adults prepared seared scallops. Children made Alaskan sourdough pancakes. 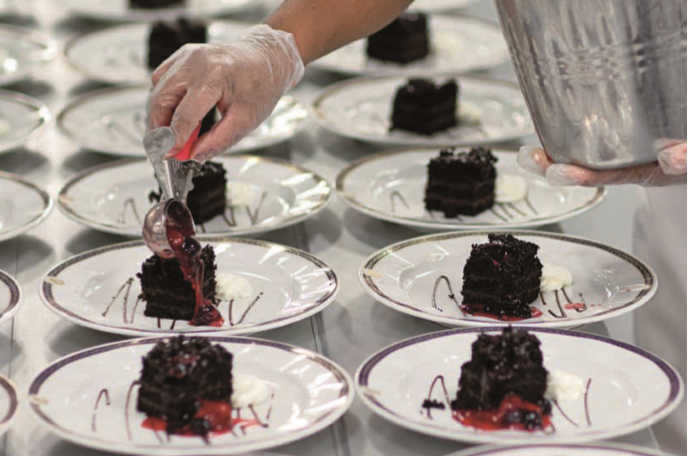 Though ships in the Holland America fleet offer similar dining options, Chocolate Seduction is unique to Westerdam. Created in 2012 in partnership with Culinary Council member and pastry chef Jacques Torres, the shop sells high-end chocolates by the piece, plus chocolate beverages and coffees with or without alcohol. 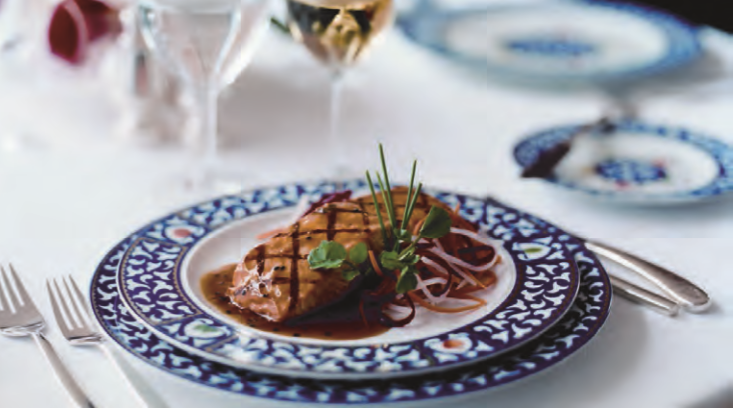 Two ships, Nieuw Amsterdam and Eurodam, include pan-Asian dining at the specialty restaurant Tamarind. An exclusive Master Chef’s Room ($89 per person with wine) takes place in the Pinnacle Grill only aboard Nieuw Amsterdam. 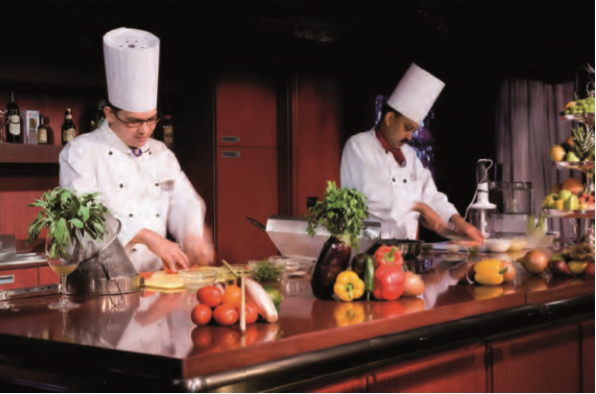 Designed by Chef Sodamin, the seven-course set menu showcases his considerable culinary talents. To enhance the experience, courses are served on Versace china and paired with premium wines poured in Riedel stemware. Last but not least on all ships is room service. Holland America excels in this 24-hour dining opportunity, most notably at breakfast. Begin your day with coffee, fresh fruit, an omelet of your choice accompanied by ham, bacon or sausage and flakey croissants. The choices are among the most varied of any major cruise line, and everyone should be pampered with breakfast in bed – at least once a cruise.